One of the main reasons I started this blog was because I needed a creative outlet. The need to learn, explore, and create with my own two hands is rooted deep within me. Having this blog gently pushes me along and helps me obtain the creativity I crave daily. Let it be said – creating and maintaining a blog is not the only way to be creative on a daily basis. I find that people often categorize creativity in to specific boxes, never choosing from more than a handful. There’s a great big world out there – let’s take the time to enjoy all it has to offer! When sitting down to write this post I found myself traveling down the ‘this is what creativity means’ road, but newsflash, creativity is not defined by one thing. Being creative can mean diy projects to one person, while another expresses creativity through cooking. Are there any new hobbies I’ve been wanting to explore? How can I inject it in to my daily routine? How much time to I have to spend on a specific task or project? Do I need to have any special supplies? Variety is highly important to me – some days I focus on being creative through whole body movements (think dancing, exercising, hands on projects) while other days I am content with a more inward expression (journaling or doodling). Time is the another factor to consider – we all have daily obligations that can leave us strapped for time. I gravitate towards activities or tasks that don’t require a large time commitment. 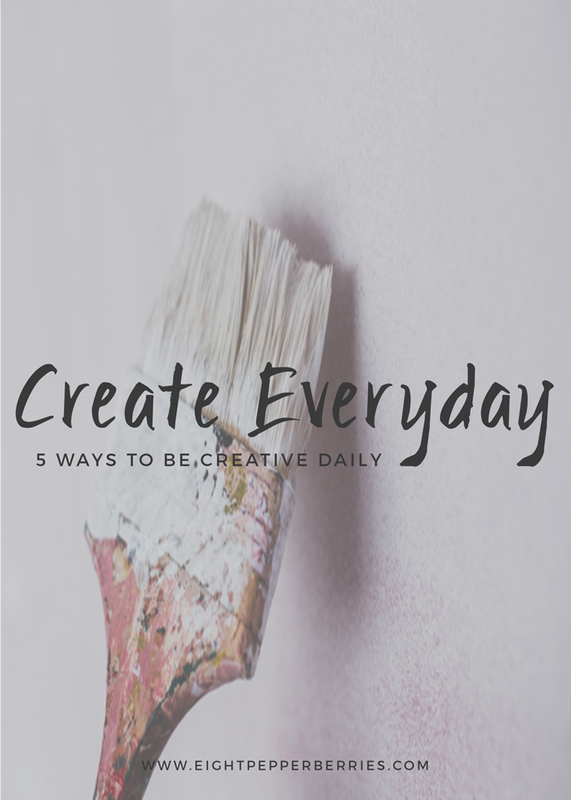 Have a desire to be creative on a daily basis too? Let’s explore some of your options. I’m in love with photo a day challenges especially the #FMSphotoaday challenge from FatMumSlim. I’ll admit though, I have a hard time keeping up with the challenges (working on it), but when I am in a creative rut I go straight to picking up my Iphone to practice some iphoneography (get the basics here). Use the list as inspiration for your daily photo. For example, day 22 is chocolate, so all you have to do is take a photo that has chocolate in it. Perhaps your favorite chocolate bar or your family around a camp fire making smores. Share your image on Instagram using the hashtag #FMSphotoaday as well as the daily hashtag provided from @fatmumslim. Check out the other photos submitted that day – like them, comment on them – it’s a great way to build community and friendships! Chantelle also shares a Fab Four over on the challenge feed @littlemomentsapp. Bonus! Use the the Little Moments app (it’s FREE!) to edit your photos and view the monthly challenges, it even generates the daily hashtag for you. If you’re still in need of a creative jump start when it comes to photography I highly recommend the Prompting Creativity course taught by Carolyn Mara Borlenghi over at The Define School (online). I took her Self and Art class and it was ah-mazzz-ing! The internet is a wonderful thing – you can learn just about anything with a click of a button. I’ve recently come across Skillshare, a website dedicated to teaching others a particular skill or skills. There are a ton of options to choose from: crafting, design, writing, culinary, and more. It connects people willing to share their talents with people willing to learn a new skill. I love that you have the option to be the teacher or the student. I do a happy dance just reading their mission statement. You can get a premium membership for a few dollars a month which allows you unlimited access to over 10,000 classes that you can learn at your own pace on the go (even offline). It’s basically a one stop shop if you are exploring new hobbies or are open to learning about a certain craft. Wanting to get out and about in your community? Check out classes at your local museum, yoga studio, or dance studio. Exercise classes are a great option to get your creative juices flowing as well (especially helps you when you are having a creative block). Talk with local businesses to see if they are hosting any upcoming workshops – calligraphy workshops are becoming very popular. Hello Pinterest! Pinterest is an amazing resource for new recipes – love that it helps you explore new cuisines as well. Utilize your boards to the fullest by organizing your boards in to categories. For example, I organize my boards by type: soups + stews, salads, breakfast, lunch, dinner, and so on. This makes finding that recipe you were dying to try easy to find again. Anyone else have those, “one day I want to try…” thoughts? I do all the time and I’m realizing those thoughts are important. Trying out a new hobby can be extremely fulfilling, you might even unearth a new passion. But don’t worry if you don’t fall in love with it – the process of trying something new is more important. It can be hard to narrow down your focus, so I’ve brainstormed 20 hobbies that can help steer you in the right direction. Writing or doodling can be very relaxing for you – especially after a long, stressful day. It’s nice to sit quietly and get your thoughts (or worries) out through written or drawn expression. Keep a journal by your bed to jot down your thoughts at the end, or beginning, of the day – I post a set of journal prompts monthly if you need guidance in the what do I write about department. Start a short story. Write an essay on a current topic. Partner with your kids to create a children’s book (you write, they illustrate or vice versa). Write a poem. Find yourself doodling in the corners of papers or on a napkin? Set aside a specific doodling notebook and doodle and draw to your hearts content. Make sometime for yourself during the day to doodle – sit in the park (or outdoors) during your lunch break or wake up early and enjoy the stillness around you. Even 10 minutes a day doing something you enjoy can boost your mood. Great tips! Sometimes I find it hard to find the inspiration for my blog posts, I’ll have to try these ideas! You are so welcome! I’m glad they are useful and inspiring to you =) Thanks for stopping by Fatima!